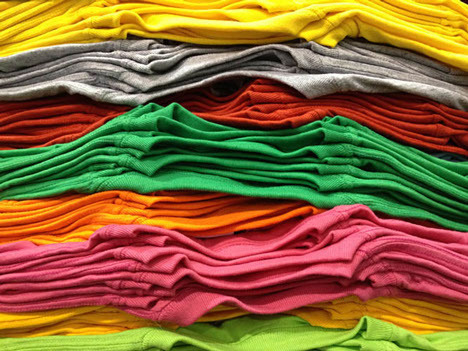 The Most Popular Cheap T-Shirt Colors Are…. This is a question we hear all the time at the Adair Group from curious customers. It’s a good thing to know, especially if you’re opening up your own t-shirt wholesale business– though having a warehouse full of teal t-shirts might be fun to look at, it would take a long time to move the product. It’s hardly a surprising list, but it’s interesting to know. In fact, white and black t-shirts are so popular that many of the top t-shirt mills have production lines exclusively dedicated to running blank white or black t-shirts. However, as popular as white and black t-shirts are, it’s still important to have a wide range of other colors to choose from. Making t-shirts for sports teams, clubs, colleges, or other specific affiliations is much easier when you don’t have to hand-dye your t-shirts. If you are interested in making your own unique t-shirts, consider buying a bunch of cheap t-shirts in white and tie-dying them, or bleaching patterns into plain black t-shirts. We have lots of options to choose from at the Adair Group!